Last week, I attended a meeting of the Bicentennial Committee that has worked diligently for over two years on our upcoming celebration of the Archdiocese of Boston’s 200th anniversary. At the meeting, we talked about the calendar of events, and there was a great sense of hopefulness in the plans for the bicentennial year. Under the leadership of Father Bob Connors, the committee has planned various activities, including the celebration’s opening Mass on the first Sunday of Advent, Dec. 2. Hopefully representatives from all parishes and Catholic organizations will be able to come to Holy Cross Cathedral to mark that day with us. We are now just six weeks away from launching the Bicentennial, and I would like to give Father Connors the opportunity to tell you more about it. 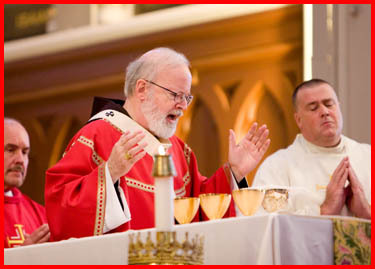 I would like to thank Cardinal Seán for giving me this opportunity to share with you some of the initial programs surfacing for the Bicentennial of the Archdiocese of Boston. The Church of Boston is about to reach a wonderful milestone. On April 8, 1808, in order to address the increase of Catholic immigrants, the Diocese of Baltimore – the only diocese in the United States at the time – was divided into four new dioceses: New York, Philadelphia, Bardstown, KY (now Louisville) and Boston. Initially, the Diocese of Boston covered most of New England. As the need led to more dioceses, Boston encompassed Maine and Massachusetts, and finally, the boundary that we have today outlined roughly by Route 495. In those two hundred years, the history of the Archdiocese has been blessed with people, places and events and has influenced both the country and the world. Like any institution or family, our history has had its highs and lows, reminding us of our human limits and dependence on the Lord. 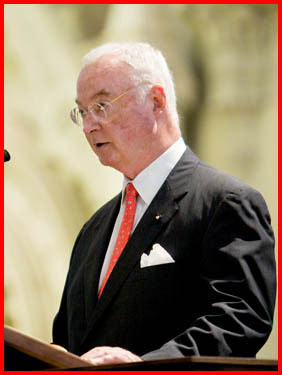 However, from unique and spirit-filled personalities to the missionary zeal of the St. James Society to the extreme generosity by the people of the Archdiocese, we have a rich history of which we can be very proud. This Bicentennial moment is an opportunity to continue our mission and ministry in bringing the Good News of the Lord Jesus Christ to all. It is a moment of revitalization. For almost two years, the Bicentennial Committee, representing a broad spectrum of the people and ministries of the Archdiocese, has met on a regular basis to prepare for this upcoming moment. 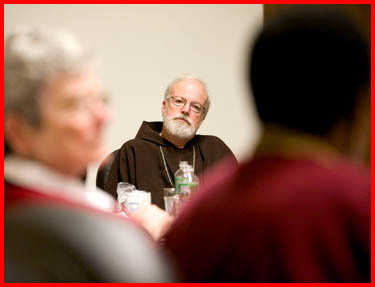 The committee has been consistently enthused and we are so grateful for the support Cardinal Sean has given us. 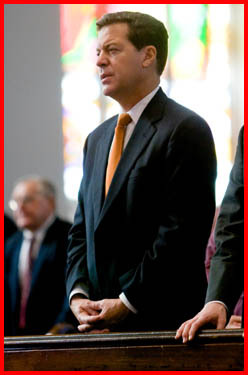 From the very beginning his vision was to use this milestone to re-energize the Church of Boston. It is a time to acknowledge our past and to move into the future; a time of reconciliation and forgiveness; a time of healing and hope; a time of evangelization and welcome to so many that are separated from the church. The logo for the Bicentennial stresses this journey, history and hope for Boston. The theme says it directly: “Journey Together in Christ.” This year of celebration can be a catalyst for unity in the Lord, who is our help and our salvation. As we begin, all the parishes and agencies of the Archdiocese have been invited to use the Bicentennial to enhance their own local goals as we join together to build the Church of Boston. We are excited and confident that “together” we can journey forward in Christ. 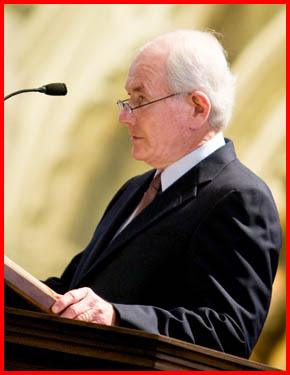 Our official year of celebration begins on Sunday, December 2, 2007, with an Opening Liturgy at the Cathedral of the Holy Cross. The Cardinal has designated the 2008 Liturgical Year for our time frame. We begin on the First Sunday of Advent; we end on the Feast of Christ the King – November 23, 2008. Coincidentally, it is the Year A of the Liturgical Cycle – centering on the Gospel of Matthew. When Matthew wrote his Gospel, he addressed the Jewish/Christian community in the years after the destruction of the Temple of Jerusalem in 70 AD. Many of the converts to the faith were drifting away and questioning their loyalty and faith in the Lord and his message. Matthew uses his Gospel to convince them that they made the right decision. He encouraged them to remain loyal to the Church for it was a precious gift they needed to rediscover. How apropos of our own time: his message then is the message of today. 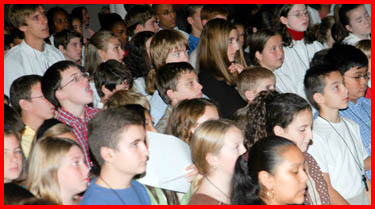 During the year many events will be held throughout the Archdiocese. 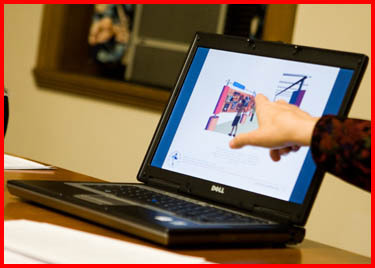 Most of the information will be readily available on the new web site which one can reach at www.Boston200.org or through a link on the Archdiocesan web site at www.rcab.org. Let me share with you a few of the upcoming events that are in the organization stage. Immediately after the Opening Liturgy on December 2, all the parishes have been asked to conduct a three-day retreat to begin our bicentennial year. During the Season of Advent, as a total Archdiocese, we will be asking for the Lord to “come” into our lives in a special way. The Retreat may be held in individual parishes or clusters in an area, and the idea is to have us all praying together during this “preparation” Season of Advent prior to Christmas. From then, we hope to have a wide variety of events and programs. 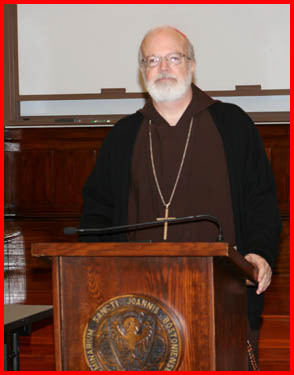 The Catholic Colleges of the Archdiocese will have special programs and seminars surrounding the bicentennial themes. Each Region of the Archdiocese, under the guidance of the Regional Bishops, will set aside a special day to gather all the people of the region – young and old – and celebrate our being a Catholic family. 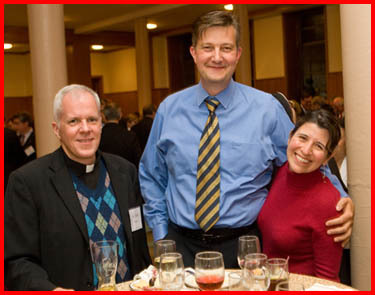 There are special projects being developed to honor the work and ministry of the Religious Men and Women who have served the Archdiocese so well over the past two hundred years. 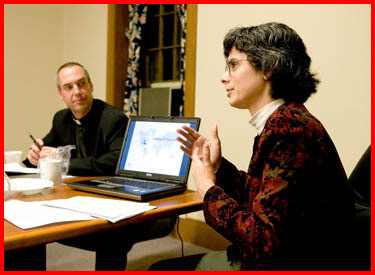 Another on-going effort is gathering an oral history, especially through the experience of the senior priests of the Archdiocese. Our Catholic Schools and Parish Religious Education Programs will offer special events and programs for the young. The service agencies of the Archdiocese will be using the bicentennial as a catalyst to enhance their own specific service and ministry. The Boston Pilot, the oldest continuous running Catholic newspaper in the country – another gift from Boston – will offer articles and information during the year. That communication will be enhanced by the efforts of Boston Catholic Television. We all know that a major contribution has been made by the Ethnic communities of the Archdiocese over the past two centuries. 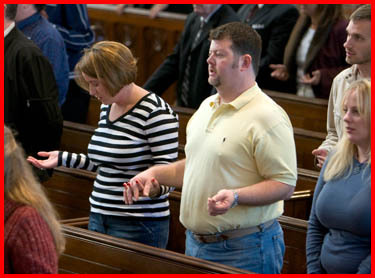 The diversity of the Church of Boston is extensive and affirming our unity in that diversity is an important priority. Not forgetting our youth, the Bicentennial will join with Proud 2B Catholic next summer to center on families, youth and young adults – all they have given, and all they can give as our journey continues – for they are the future of our Church. So it is about to begin in a few weeks and I want to extend an invitation to each of you to join our effort to make this year a year of grace and hope. 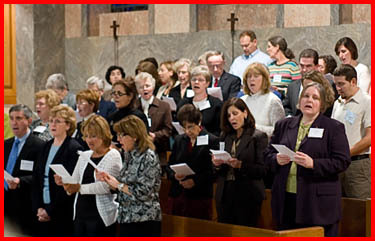 Volunteer in your parish to help with any plans that are being made; reach out to your family and neighbors who may be distant from the church right now and invite them to return; and, above all, pray for us all – that this Bicentennial year will bear great fruit for our Archdiocese and its people as we journey together in Christ. 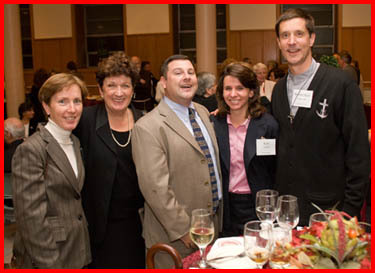 Last Thursday I attended an evening in appreciation for the dedicated service of lay leaders in the Archdiocese of Boston. 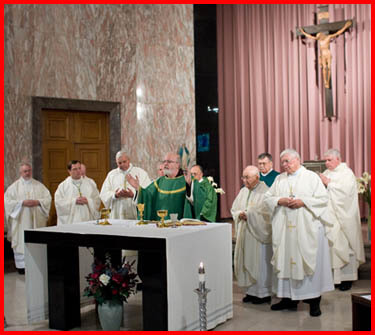 Many lay people who serve on different boards and committees or volunteer in some other ways were invited to be present at a Eucharist concelebrated by some of the auxiliary bishops and many other priests. A reception followed, and the whole event was an opportunity for us to express our appreciation and profound gratitude for their commitment to the mission of the Church. Their leadership is a gift and blessing for our local Church. 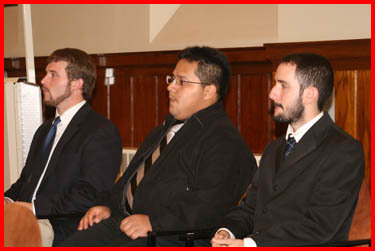 On Oct. 12, I attended an evening of prayer with the seminarians at St. John’s Seminary. It was my first meeting with them of the year. 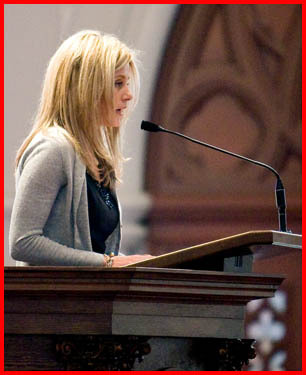 I was there for vespers and dinner, and then I gave a short talk and we had a dialog. It was very good to see that the Spirit is so strong among the seminarians. In addition, we have a much larger group this year, and that is very encouraging. 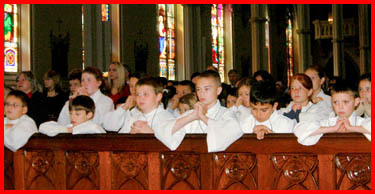 The following day we celebrated a Mass at the cathedral for altar servers. Over 500 servers from many different parishes were in attendance. 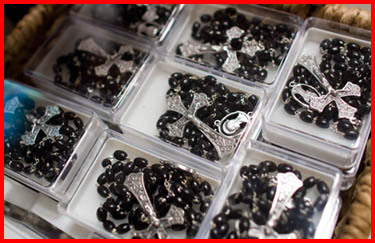 Many of them came in their cassocks and surplices or their albs. We had crosses and certificates that we gave to all of the servers. Then, two boys and two girls were singled out with special awards, which the Vocations Office have dubbed the Pope John Paul II and Mother Teresa of Calcutta Awards. One senior and one junior server were selected for each award. The recipients were Brian McManimon of St. Catherine of Alexandria Parish in Westford, Shane Walsh of St. Augustine Parish in Andover, Michelle McInnis of St. Elizabeth of Hungary Parish in Acton and Sally Barros of St. Patrick Parish in Roxbury. 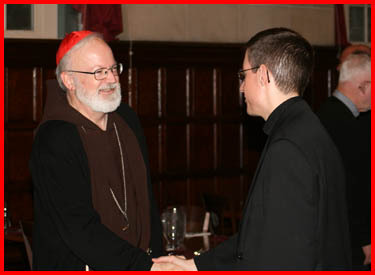 There were many priests that accompanied the servers, and the Vocations Office was very much involved in promoting it. 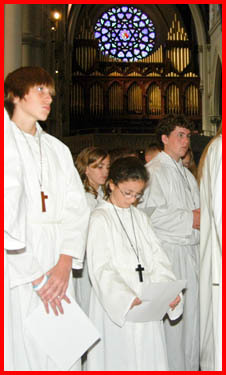 It has been many years since the Mass for altar servers had been celebrated in the archdiocese. I was very pleased by the response this year. It was a wonderful event and is something that we would like to restart as a tradition here. What Andrew did not even suspect was that Jesus was about to perform a miracle and planned on using that youngster’s lunch to work the miracle. Jesus took the bread, gave thanks and distributed the bread to the crowd — and twelve baskets were left over from five loaves and thousands of people ate their fill. Why do I say this lad was our first altar server? Because he was willing to give what he had to God — he could have said — “This is my lunch, let everybody else fend for themselves,” but, he didn’t. He gave the bread to Jesus. And Jesus worked a miracle that was to reveal His plan to give us the Eucharist. In today’s Gospel, something curious happens. These throngs of people follow Jesus into the desert because they are hungry for the word of God. But another type of hunger takes over. Jesus feeds them through the miraculous multiplication of loaves and fishes. Then the people become so fascinated by the free lunch they try to make Jesus king — so Jesus hides out in the mountain. We must never become so fascinated by God’s many gifts that we lose sight of the giver of those good gifts—our God who wants to give us so much more, because he wants to give us Himself. When I was young, I never liked leftovers. So this Gospel used to bother me a lot because it talks of the 12 baskets of leftovers. I used to ask myself: Why didn’t Christ make just enough so that there would be no leftovers. That would have been a better miracle. But the leftovers are part of the sign. When Jesus works this miracle, He first takes the bread and gives thanks, then distributes the bread. The word for giving thanks in Greek is Eucharist. The gestures Jesus used here are the point to a great miracle when Jesus takes bread at the Last Supper and gives thanks, breaks the bread and then says, “Take and eat, this is my Body.” — Changing the Bread and Wine into His Body and Blood is the real miracle of the Mass. The many baskets of leftovers at the multiplication of the loaves is like the first miracle where Jesus at Cana turns the waters in wine, not just a few bottles, but hundreds of gallons. The superabundance of God’s gift is part of the sign of the Eucharist. God gives us more than we need, more than we could ask for, especially when He gives us the Eucharist. The problem with the people in today’s Gospel is that they got so distracted by the sign, the free lunch, that they missed the point. They wanted to make Jesus king so they would never have to work again. I always like to compare this miracle with the miraculous draught of fishes. Jesus went to the Sea of Galilee, and Peter and the others were fishing. They caught nothing. Peter and the Apostles were lousy fisherman. Jesus tells them to cast their nets on the other side, and the nets were filled to the breaking point. When they reached the shore, they were excited. The catch was worth a fortune, but Jesus said, “Follow me.” And you know what? They left their boats and those nets full of fish, full of money and followed Jesus. They were not distracted by the fish. They saw the sign of Jesus’ power and love; and they left everything to follow Jesus. 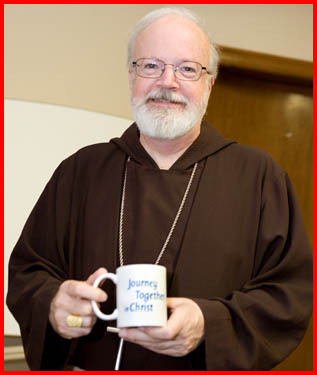 Everyone here has a vocation, a call to follow Jesus. Some are called to get married and be moms or dads. Some are called to be sisters and serve in the Church community, and some are called to be priests. There are many vocations, but basically they are all the same — we are called to do God’s will in my life. In prayer and reflection, we discover what the Lord wants of us. And if we do what God wants, we will find happiness. There is always a danger of being like those people in the desert, distracted by the gifts, missing the signs of God’s power and love. As altar servers, you are privileged to be close to the most important sign of all, because the Eucharist is where Jesus makes a gift of Himself to us. We see the sign of bread and wine, but what is really there is the Body and Blood of Jesus who loves us so much, He makes Himself a gift, our spiritual food. Nourished by God’s love, it prepares us for our mission of service, of working to make a civilization of love. 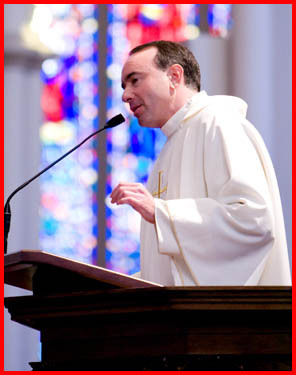 It prepares us to embrace God’s call to holiness, to a Christian vocation. The lad in the Gospel gave Jesus his lunch, and Jesus used it to feed thousands. Give Jesus your heart, and Jesus will use it to make this a better world. Love Jesus in the Eucharist where He makes Himself little, to be close to us, to strengthen our faith and our love. When St. Francis was a boy, he used to dream about serving the greatest boss in the world, the greatest master, the greatest King. He finally discovered that the greatest King is Christ, and he served Him joyfully. At Mass you are serving the greatest king of all. Be focused on the great mystery of God’s love for us. Give Jesus your heart, and He will multiply the gift. 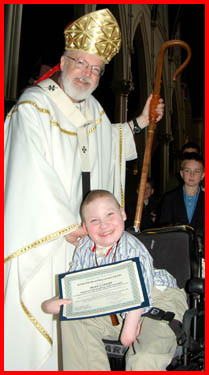 This young man, Brian, regularly serves Mass at Franciscan Children’s Hospital, where he resides. I was proud to have met him. On Sunday, I celebrated the Red Mass at the cathedral. It was very well attended, and many members of the Catholic Lawyers Guild were there, including the president Judge Joseph Nolan. Wil Rogers, who is vice president of the guild, was there as well. Father Jim DiPerri, from the Faculty of Pope John XXIII seminary and a cannon lawyer, gave a wonderful reflection at the Mass. 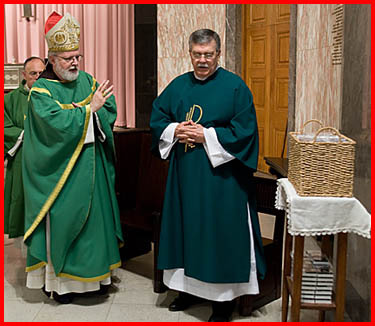 In his homily Father DiPerri stressed that Catholics are called to announce the Good News of Jesus Christ everywhere, even if it is inconvenient. He reminded people that on our churches there are crosses, not weathervanes. Brownback gave an address. It was stunning. It was very beautiful. In it, his commitment to the pro-life cause was obvious. The people were very pleased with his presentation. 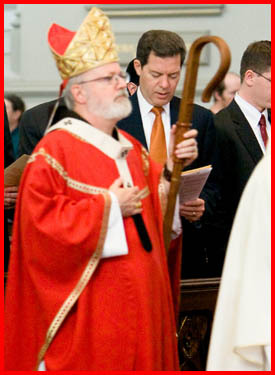 I read in America, the national Catholic magazine, about a bishop in the Sudan who named a well after Sen. Brownback. His work in Africa is much appreciated as are his positions in favor of immigration reform, even though that cost him dearly in his party, the way that he has always defended the gospel of life and defended marriage. It was very encouraging to have a Senator of the United States speaking the way that he did to our legal community. 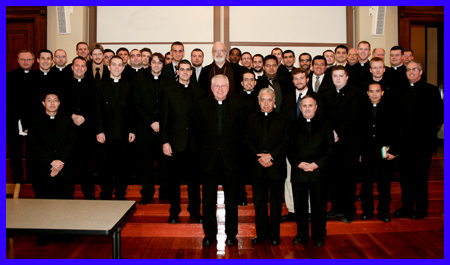 For the photo of the week, here is a group picture with our seminarians studying at St. John’s. Please pray for them that the Lord may strengthen their vocation to serve the people of God as priests.